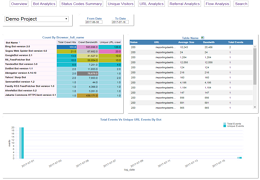 LogTiger Analyzer is easy to use Log Analytics software. LogTiger allows you to create unlimited projects and upload log files. It comes packaged with stunning dashboards and reports for Log Analytics. How can Log Analysis help Technical SEO? What bots are visiting and indexing pages? Can you identify spam traffic or traffic from spam bots? Is Google or Bing able to access and index all your important pages? Which of your pages are having technical issues? What are your top crawled pages by each bot? What is the crawl frequency by each bot? LogTiger is built on top of InfoCaptor Dashboards and it comes packaged with the following set of reports and dashboards. 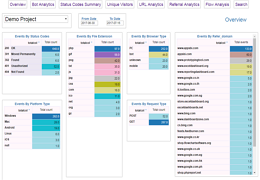 Log Analytics Overview dashboard displays summary of all events by different categories and dimensions. You can see total events by status codes, file types, browser type, operating system,platform type, request type and referrer. Bot Analytics displays Crawl Budget,Crawl bandwidth, Crawl Hits, Unique URLs crawled by each bot. You can see which bots visit your site. It displays the URLS visited and also the frequency of their crawl visits. This is a very crucial dashboard in determining the various HTTP status by different file types. You can easily see which file types produce 3XX and 4xx errors and drill down to the exact file location. This dashboard displays the unique visitors to your website. It displays the total unique hits by the date range you have selected as a pivot table across the hour of the day. URL Analytics displays top level metrics such as total events, total bandwidth and number of visits by each bot. It also displays the various status codes against each URL. Referral Analytics displays all Referral URLs and top level metrics such as total events, total bandwidth and number of visits by each bot. It also displays the various status codes against each referral URL. 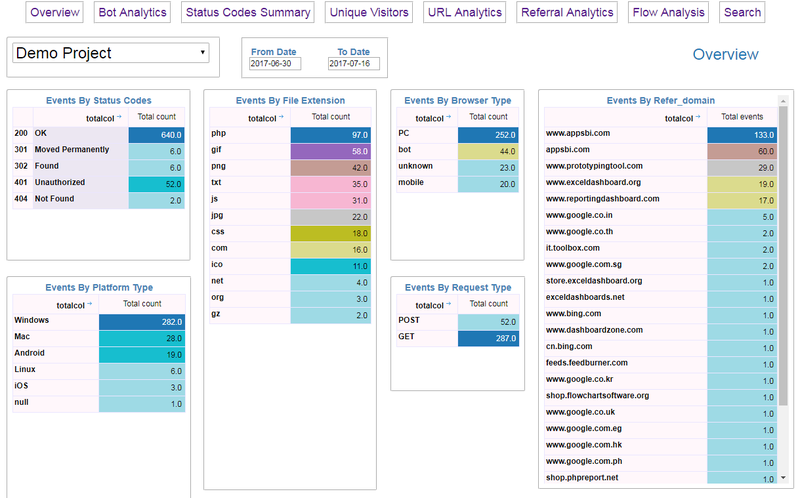 Search dashboard simply allows you to search for any string across all the log events. It provides quick filters for status codes and date range. You can search on URL, Referral, User agent and browser strings. All your parsed and uploaded data is store in MySQL db. LogTiger provides access to InfoCaptor' visualizer and dashboard editor. With this powerful feature you can do data discovery on your log data and build custom dashboards. LogTiger is free to download and use. You can create multiple projects and upload the log files against it. However each upload is restricted to 1000 events. If you have a log file larger than 1000 events you may split the file and upload them individually. The paid version does not restrict on the number of events. For a small fee you will be able to create any number of projects and upload files with millions of events. What are the benefits of Log File Analysis? LogTiger includes complete InfoCaptor dashboard editor so you can build custom reports and dashboards using your log data. Currently we are providing only windows installable. If you need to install on Linux or Mac please email us and we will send instructions and links for necessary downloads. Once you install, it will provide link to get free license for Log Analyzer. A project will hold all the log files together. For e.g each website along with its sub-domain logs can belong to a single project or you can create project for the main site and separater project for each sub-domain. Once you create the project, it will ask you to upload the log file. Make sure you select the project before uploading the log file. Once uploaded the log file will be processed in two stages. First it will parse the log and convert into a CSV file. In the second stage it will upload the CSV file to the in-built MySQL database. Once the data is loaded it guides and navigates to the dashboard. 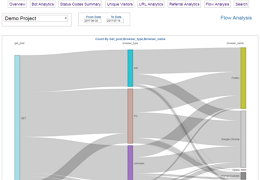 Want to analyze your web logs?